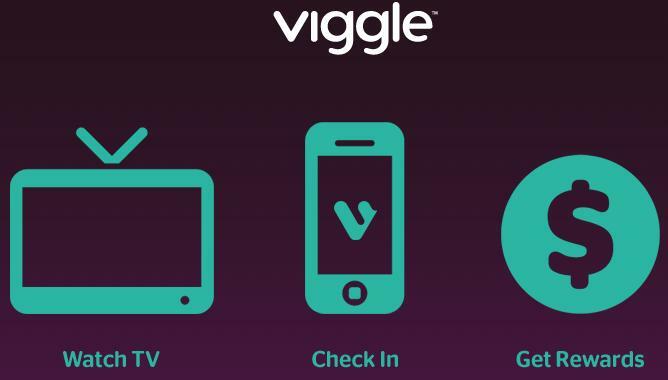 Viggle is an app you can download through Google Play or the Apple Store, and it rewards its users for watching TV. I mean, who doesn’t want free things for doing nothing? Viggle is probably the best app I’ve ever downloaded. I watch more television than any normal person should. I have two DVR’s in my apartment just so I can record four things at once, and even that isn’t enough sometimes. I know, I’m a crazy person. So when I find out that I can get free things like gift cards and iPods just for checking into a TV show, I was all about it. This is so much better than GetGlue, where you just get stickers (sometimes) for checking into TV. So how does it work? You open the app and touch ‘Check In’. The app then listens to your TV and knows exactly what show, which episode, and at what part of the episode you’re listening to. You then earn 1 point for every minute you watch of that program. So, an hour show gets you 60 points and a half-hour show gets you 30 points. Viggle also has featured shows, which comes up under the ‘What’s On’ tab like you see above. You then earn a certain amount of bonus points for that featured show. So, as seen above, you would earn an additional 300 points plus the 60 points for watching an hour long show. 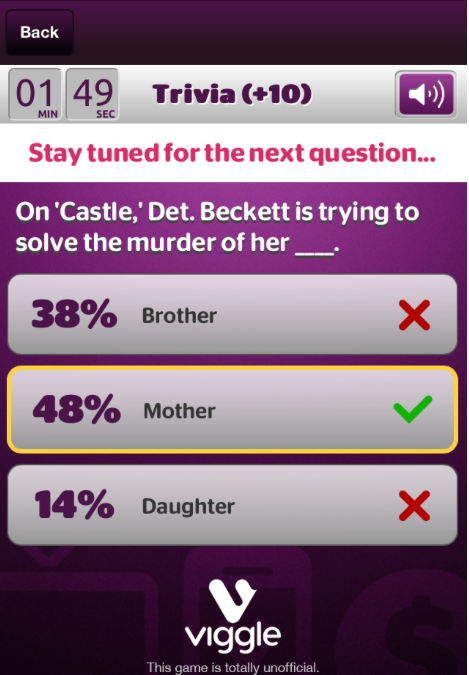 Some shows that are featured also allow you to play along with Viggle Live, a trivia game that earns you points for each correct answer you get. Some shows earn you 25 points per correct answer, and some earn 10 points per correct answer. Then, depending on how many other people vote for the incorrect answers, you could earn 1 or 5 points when you’re wrong for being close. Viggle Live is not affiliated with any of the shows and is “totally unofficial”. In my experience, most of the trivia for shows involves questions from older episodes. Though for newer episodes of new seasons, the questions are about the show you’re actually watching. Which is cool, because then you actually have to pay attention to what you’re watching. You can also play Viggle Live during award shows, and can earn points for predicting who the winners will be. So cool. 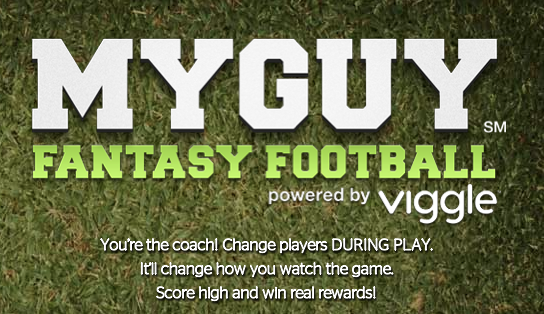 Another great feature by Viggle is their fantasy football game called MyGuy. This you have to play live, and you choose a player for each play of the game. You can choose any player on either team’s offense, or you can choose a team’s defense or special team. You earn points for every good thing your team/player does like getting a touchdown, field goal, tackles, making yards, throwing passes, etc. You can also lose points, though, when your player/team does negative things like throwing an incomplete pass, allowing a touchdown, getting sacked, etc. Whoever gets the most amount of points by the end of the game gets a bonus 1,000 points along with the points you get for watching a featured game and each minute you watch the game for. Second place gets 500 points, third gets 300, and so forth. While the games are fun, the best part of this app is obviously the rewards. As of right now, the least amount of points you need in order to cash in on a reward is 2,000, and that will get you $10 off a purchase of $40 on Origin, a site where you can buy video games online. 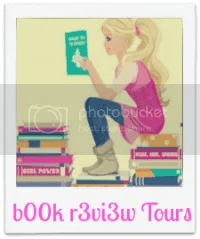 Other rewards include a $10 iTunes gift card which costs 25,000 points, a $5 Starbucks gift card which costs 12,500 points, and $5 gift cards to Barnes & Noble and Fandango, each for 5,000 points respectfully. 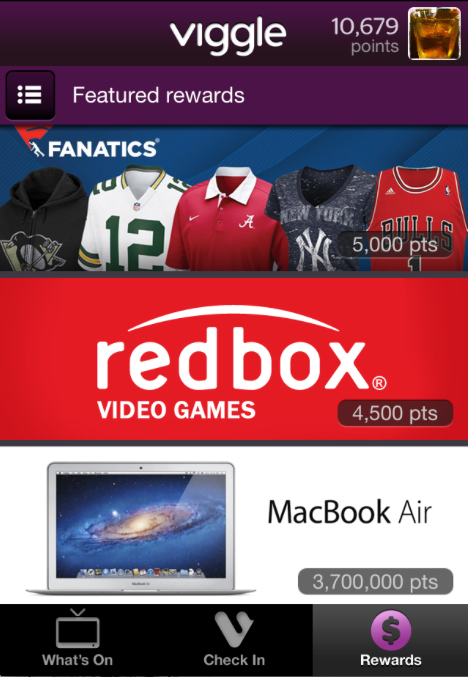 More expensive rewards include an iPod touch, Apple TV, and a Royal Caribbean cruise. There are tons of other rewards too, so there’s something for everyone. Right now I’m averaging about 10,000 points a week between all my Viggle Live shows and MyGuy games. I mean, I don’t know a thing about football, but I come in first place almost every time. And yes, I am totally tooting my own horn. I’m pretty much getting a reward every week, and it’s pretty much zero work. This is an app that everyone with a smart phone NEEDS. ← The Lohans are absolutely ridiculous. As usual.